And for those that would say I would never use it. Then you don’t know me. I already had wheat flour soaking overnight knowing she would arrive today! I felt a little rich opening the box, I never normally would ask for something so nice, but my husband wanted me to get it. I think I might make her cover too. I read on the net a good idea is to put your mixer on a tray, for easier cleaning and moving about the kitchen. UPDATE: When I wrote this the KITCHEN AID mixers were on sale for 229.00 with a 30 prepaid visa gift card refund. This morning I went out there and black and white mixers (no more red 🙁 are now up to $249.00 with the same gift card. I have been wanting a Kitchen Aid mixer for a long, long time. My neighbor, so sweet, gave me a Sunbeam mixer from the 70’s last year. However the first time I used it to make bread it started smoking. The kneading was a strain on the machine. Then about 2 weeks later, I broke the main bowl. And since I wasn’t having glass eating circus people over for dinner (that night at least) I ruined that meal. My desire for a mixer started with the making of bread. At first whiff the bread maker was amazing. However barely squeezing one meal out of loaf made me realize I need something bigger and without a telltale breadmaker paddle mark on the bottom. So I have been wanting one and being the cheapo that I am have been continuing to look at garage sales, craigslist, etc, all the while making bread by hand. Doing it this way makes you see why caveman walls have large forearmed women. I finally gathered that these machines are hard working and long lasting and if for some reason it outlives you, your administrator isn’t going to sell it either because it gets put in the will (I figured this when I didn’t find any at estate sales either). I found at this good deal at slickdeals.net. A good place to check daily and if you are looking for a deal on something special you can set up deal alerts. This is what I did, I put the search parameters to tell me when anything Kitchen Aid came up. I knew that at Christmas time there were some good deals out there. 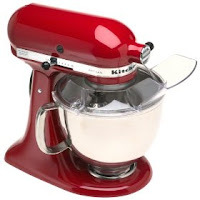 And now that I have some Christmas money I figured I find a KA mixer bargain somewhere…. At first I didn’t have the credit card on me so I waited a day. I got lucky they added red to the sale inventory! I ordered it last night and the cool part is that I also signed up for a FREE TRIAL of Amazon Prime, I get the mixer in 2 days! Amazon Prime is a thing Amazon is pushing, for 79.00 a year you get free 2 day shipping on everything. Pretty neat, I am going to put on the calendar 29 days from now to cancel. Because remember I am el cheapo!